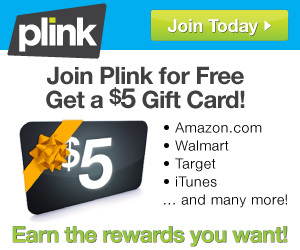 In case you have missed my past posts about this great new rewards program, I wanted to remind you that when you sign up for Plink, you will get a FREE $5 Amazon Gift Card! From shopping at the GAP, to taking in a movie, to picking up coffee at Dunkin’ Donuts and filling the gas tank at 7-11, Plink is a rewards program that pays you back for your every day spending. When you make purchases with your credit card at any of the stores/restaurants/establishments with which Plink has a relationship, you’ll earn more points, which you can convert into gift cards to Amazon.com, Home Depot, Walmart and more. Once you get your $5 gift card, you just keep earning points for your everyday spending – and those points can be turned into more gift card rewards! Plus, thru Sunday, August 11th, you can earn a bonus 50 Plink Points just for downloading the FREE Dunkin’ Mobile App (on iPhone or Android). Make life simple with mobile payments and coupons, store locators and virtual gift cards – all on your mobile device! Bonus points from Plink will be awarded within 7 business days.